Skirmish battles in the ruined and cursed city of Mordheim. 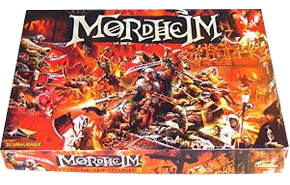 First there was Necromunda, then there was this fantasy version of Games Workshop’s tabletop skirmish combat system—Mordheim. A great boxed set with some spectacular card and plastic ruined buildings in it, the game looks fantastic when set up and, due to the small warband size, is easy to play and very cinematic.